Visiting Chinese Kuomintang (KMT) party Chairman Lien Chan made a nostalgic visit Saturday to Xi'an, capital of northwest China's Shaanxi Province, as well as the city where Lien was born and spent his childhood. Flocks of local people, waving flags and banners, lined the streets to welcome the KMT leader. Xi'an is the third leg on Lien's eight-day mainland tour. The 68-year-old Lien was born in Xi'an in 1936 and left the city eight years later. "Childhood is the most beautiful and valuable period of time for anyone under whatever circumstances," said Lien. Lien said he wished to trace some childhood recollection during his stay in the city. He was greeted at the airport by students and teachers from Houzaimen Primary School, where he had studied more than six decades ago. Although his childhood memories were mostly related to the wartime chaos as China was then suffering an invasion by Japan, the scenes, people and primary school education in Xi'an have lingered in his mind throughout the years, said Lien. "Xi'an not only belongs to China, but also has become a world cultural heritage site representing a long-standing spirit," said Lien. He called Xi'an "our ancient cultural capital" and "an embodiment of the amalgamation of varied cultures and nationalities" for its location at the start of the Silk Road. "We are very much enlightened by the long-standing and tolerant spirit of Xi'an," said Lien. He called for a "bright and beautiful future" for the Chinese nation on the basis of more understanding and mutual trust across the Taiwan Straits. At about 3 p.m., Lien arrived at the Houzaimen Primary School and watched art performances by students and teachers. He brought some gifts to the school, including a history book on Taiwan and his own works titled "Only Changes Bring Hopes." In his speech, Lien expressed the hope that his "young schoolmates" would cherish their peaceful childhood, since his own was marred by war and chaos. The school gave him a seven-meter-long roll-painting depicting Chang'an, one of the oldest Chinese capitals which is located somewhere close to today's Xi'an. 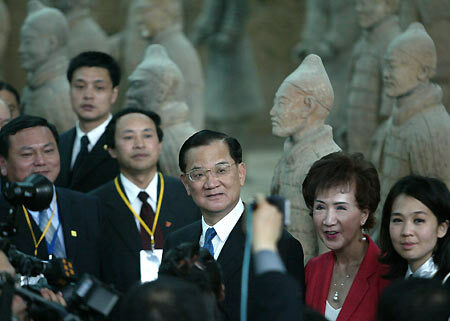 Chinese Kuomintang (KMT) Party Chairman Lien Chan visits the museum of terracotta soldiers and horses in Xi'an. At about 5 p.m. Lien went to the famous Terra-cotta Museum, known as the "Eighth Miracle of the World." Lien was allowed to stand close to the terra-cotta warriors and horses dating back to the Qin Dynasty (221-206 B.C. ), with Museum Curator Wu Yongqi as his guide. Lien was presented with a rare gift -- a piece of earth taken from the tomb, which carries prints of ancient craftsmen creating the miracle. At the end of the visit at the tomb, Lien wrote an inscription for the museum. It reads, "The Qin Tomb visit stirs my emotion for the people, and I have crossed the Straits for a win-win deal." In the evening, Lien held a meeting with Li Jianguo, secretary of the Shaanxi Provincial Committee of the Communist Party of China. The provincial party chief also hosted a banquet for Lien and his 60-member delegation. Lien, who arrived in the mainland on Tuesday, is expected to visit his grandmother's tomb on Sunday before flying to Shanghai, the last stop of his eight-day journey. He is leaving the mainland on May 3.